General Ship Corporation of East Boston, Mass., has been purchased by a group of private investors who will continue the ship repair and shipbuilding activities of the yard. Principals are James Harvie, president and chief executive officer, and Keith A. Brown, executive vice president and treasurer. 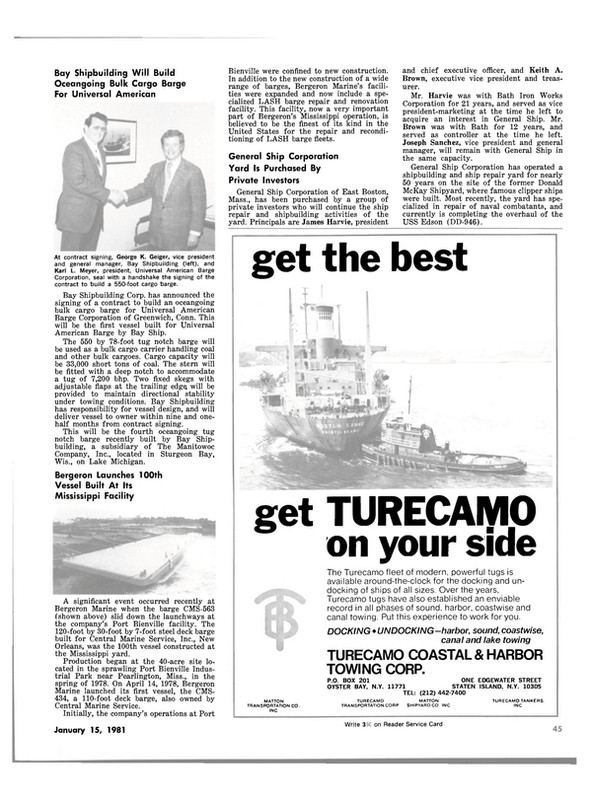 Mr. Harvie was with Bath Iron Works Corporation for 21 years, and served as vice president-marketing at the time he left to acquire an interest in General Ship. Mr.
Brown was with Bath for 12 years, and served as controller at the time he left. Joseph Sanchez, vice president and general manager, will remain with General Ship in the same capacity. General Ship Corporation has operated a shipbuilding and ship repair yard for nearly 50 years on the site of the former Donald McKay Shipyard, where famous clipper ships were built. Most recently, the yard has specialized in repair of naval combatants, and currently is completing the overhaul of the USS Edson (DD-946).